Race is not a legitimate category to use in medicine, top scientists declared at the world’s biggest science conference this week. In the US, African Americans are told to watch out for hypertension, white people for multiple sclerosis, Asians for heart disease, Hispanics for diabetes, and so on. But on Friday, leading biologists said those general warnings are based on ‘bad science’ and do no more than fuel ‘racial prejudice’. Among them, anthropologist Keith Hunley of the University of New Mexico presented a new map of genomes around the world, finding few differences between the clusters of racial groups that are often cited in medical research. By lumping people into distinct broad categories, he and others warned, we risk ‘hyping’ certain inherited health risks for some and underestimating them for others – while sewing division, stereotypes and ignorance within society. ‘We have this notion that there are variants that are unique to certain groups, that there are genes that are unique to certain groups. And that’s almost never the case,’ Dr Hunley said as he described his presented his paper at the American Association for the Advancement of Science conference. He made his statement after studying blood samples of people from seven racial groups, and found 85 percent of the differences in genes was seen within groups, and only 15 percent between groups. In 2011, Stanford University geneticist Noah Rosenberg mapped out the data we have into pie charts, which suggested racial groups barely differ in their genetic make-up. Rather than a Venn diagram with many separate circles and a few overlaps, it looks more like a series of circles laid on top of each other, with a few edges that jut out. There are staunch critics of this view, including geneticist Professor David Reich, who says there are average genetic differences between racial groups that cannot be denied. What’s more, they argue, there’s not much we can do about it: in an ideal world we will all have access to our genetic profile to see our precise risks, but right now that’s not feasible. However, fuel was added to the fire at this year’s AAAS conference in Washington, DC, which featured four new papers decrying race as a biological factor. ‘Race is not biological,’ said Dr Amelia Hubbard, a biological anthropologist with a new paper on how we teach race and genetics in schools. ‘We have to think about how we as Americans, especially those teaching in classrooms, think about race,’ Hubbard added at a press briefing with Hunley and other biologists. Dr Hubbard, of Wright State University in Ohio, claims this debate has been settled by research, but ‘old ideas’ still linger within mainstream medicine. According to Brian Donovan, a science education researcher at BSCS Science Learning in Colorado, there is a sinister implication to this dragged-out debate. His latest research, presented at AAAS, suggests student who learn about racial ‘clusters’ of genes tend to assume race determines much more than it does. Investigating it in classrooms, he gave all of the students text books on heritable disorders, sickle cell anemia and cystic fibrosis. Half the room received text books that mentioned sickle cell anemia is common in African Americans and cystic fibrosis is common in Caucasians. The other half’s books had no mention of race. Afterwards, he asked them broad questions about race and genes in general. Those who’d had books that did mention race were more likely to say that they thought race influenced intelligence. 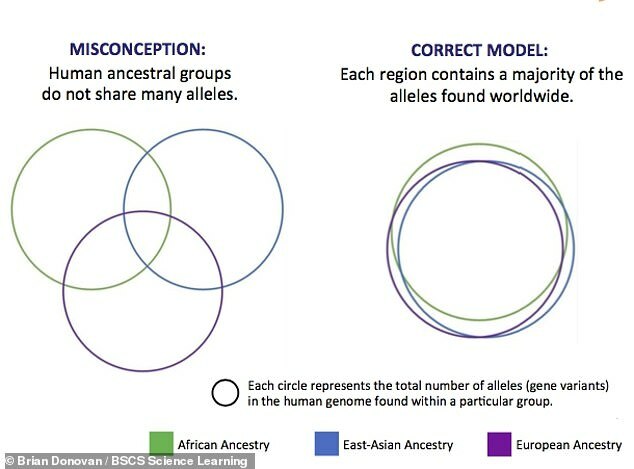 ‘There are two common misconceptions: that people of the same racial group are genetically uniform in their DNA, and that racial groups categorically differ in their DNA. ‘Both could affect the development of stereotyping and racial prejudice because it implies that all people in all groups are the same. He adds: ‘We don’t want to throw Mendel out with the bathwater,’ referring to Gregor Mendel, who first described genes, genetic groups and genetic inheritance. Calcium supplements, for example, are marketed to white patients, who are believed to have a higher risk of osteoporosis. ‘If you look on the FDA label on calcium supplements there’s still a really old disclaimer sort of statement about the research that was done in 1971,’ Dr Hubbard said. ‘And if you look into the research, it wasn’t complete. It basically puts people of different races into different kinds of risk based on a study of cadavers of people of two races. There are medical conditions that are more common among some racial groups than others. Uterine fibroids, for example, are more common in African American and Hispanic women, while bladder cancer is more common in Caucasians. But Dr Joseph L Graves Jr, a firebrand evolutionary biologist and author of The Race Myth, said many of the differences we do see are not driven by genetics but by environmental factors – including distress from racial stereotyping. ‘Take, for example hypertension,’ Dr Graves said. ‘I looked at the genes associated with hypertension in genetic variants and showed that they were actually in higher frequency in persons of European descent, as opposed to persons of African descent. Above all, he points to racism and the stress of racial tensions as a factor driving that difference. He uses himself, an African American man at the top of his academic field, as an example of how society can affect health. ‘There are numerous examples about how institutional racism kills people. In African American people of higher incomes are more likely to die from stroke than people of lower incomes – the exact opposite of persons of European descent. He says he attends more funerals now that he is working at a ‘minority university’, North Carolina A&T State University, with a higher proportion of African American faculty. ‘[We need to be] teaching not only why race is not biological but how the perception does impact people. ‘There’s a ton of scientific lit demonstrating that the effects of racism through stress and epigenetic tagging is being carried through generations. EastEnders spoilers: Kat Slater to expose Jean Slater’s secret in dramatic Stacey scenes?